how do i tack ? Push rudders over gently but firmly; and not quite all the way; if you do; you will stall the boat. Tiller over; as the boat goes head-to ease about a foot of sheet as you need to re-attach the flow when the battens pop. As you return to the new heading; sheet back in and out you go; if you do stall; back the rudders and reverse out. Remember you cannot spin on a pin-head and if windy you will go into the tack at 10+ kts (hopefully) and so it will take a little time to get going again. Matt, don't cross too too early during the tack and avoid waggling the tiller as you cross. easily done but kills boat speed. Try holding it down firmly on the rear beam so that your turn is nice and smooth. Even more critical in light winds. Probably obvious but the faster you are moving the less rudder you need. Keep that in mind as you go into the gybe but keep your speed up otherwise you will get into all sorts of trouble as the pressure kicks in hard. where should the traveller be? Simon, everything you've said is accurate. But IMO way too complicated for a first regatta. Don't forget that the fastest way to sail any boat is to keep looking out and not looking in. So as long as Matt's basic setup is ok and he can work the downhual then I'd leave fine rig adjustments for a later date. Best to keep his head out of the boat to look for shifts, lifts and other boats. 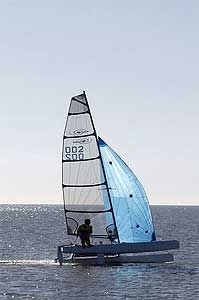 Ive seen the best sailors win in a bad boat - but not seen a bad sailor win in a good boat. And i still dont think you can fly a hull on spitfire downwind. Your F16 has tabs on the rudders to stop nose diving. You would need to be trapezing so far back on a Spit to stop that happening. I see all Spifires running very broad downwind and keeping it flat but heated. Happy to be wrong but I just haven't seen it! Send me the youtube link! Matt has crewed an F18 so he knows the workload a crew is under. And he can sail a Contender, so he should know about feeding the rudder gently in a tack. Telling the guy about crew taking the mainsheet is totally unrealistic for a makeshift team. Its rare that I disagree with you Scooby but i do think you have made Matt's weekend more complicated than it needs to be. Like which corner to bang? Naa Dave; Just covered the basic! Not as high as my F16 no; just skimming; look on Youtube for any of the Spitfire vids; windward hull just kissing the surface. I've romped around the IOW on one and few had a hull up with the kite up most of the way. Biggest thing is to get used to in cats coming from dinghies is the the time required. Do not think you can bang a quick tack and lee bow another boat. The boat will go slow through the tack and you may well park it a few times. Give yourself time and space otherwise you upset a few people! When we come in there is a ramp and not a huge margin for error, what's the best way to slow the thing down ? >come in fast and swing it into the wind?